Aside from the obligatory Easter Egg Hunt, Easter Sunday is the perfect excuse to indulge in this Rosemary and garlic roasted leg of lamb, minted jersey royal potatoes, purple broccoli and gravy. It's the only savoury thing you'll need all day, the rest is for chocolate! To prep the meat, break the rosemary into small stalks, no bigger than 2cm and cut each clove of garlic in half lengthways. Pierce the skin of the lamb 10 times, placing the garlic and rosemary into these piercings. Season generously with salt and pepper. Lay the remaining rosemary on the bottom of your roasting tray. Place frying pan onto high heat with 50g rapeseed oil. Once the oil is smoking hot, colour the meat in the pan until golden brown all over., then place the lamb in a preheated oven @ 140oC for 45minutes. 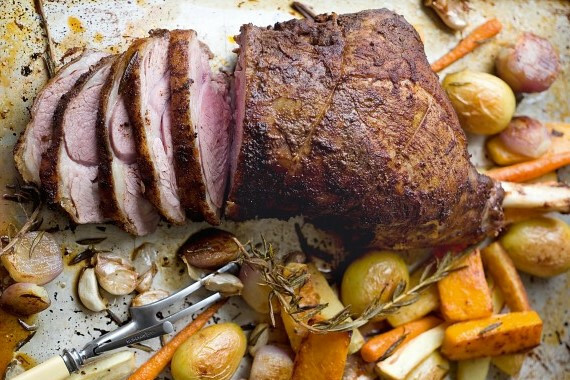 Remove lamb, cover with tin foil and allow to rest for 45 minutes (this will help tenderise the meat). While the lamb is in the oven you can start to prepare the potatoes. First pick the leaves off the mint stalks. Wash excess soil and dirt from the potatoes, place in a pan with cold salted water (approx. 10g salt per litre), along with the mint stalks. Bring the potatoes to the boil, then gently simmer until they pass 'the knife test' (this is when you can place the blade of a knife into the potato, try and lift up and the potato will fall off). Dice the butter into 1cm dices, finely chop the mint with a sharp knife and grate the skin of one lemon. Drain the potatoes and mix with the butter, lemon zest and mint. Check seasoning and add more if required. Heat the gravy on a medium heat, adding any excess liquid from the lamb roasting joint. Place a stainless steel pot with salted boiling water on the stove and boil the broccoli for 3 minutes before draining. 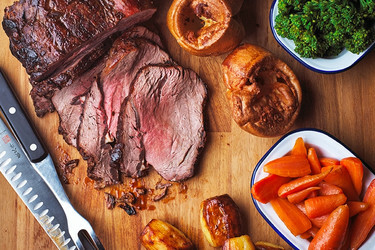 Carve the lamb, onto a serving board, place the other ingredients into their own separate bowls and serve 'family' style in the centre of the table for everyone to crack on with. 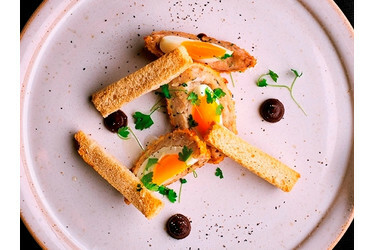 This summer recipe is a wonderful dish for a beautifully presented starter or perfect for a tasty addition to your picnic hamper.